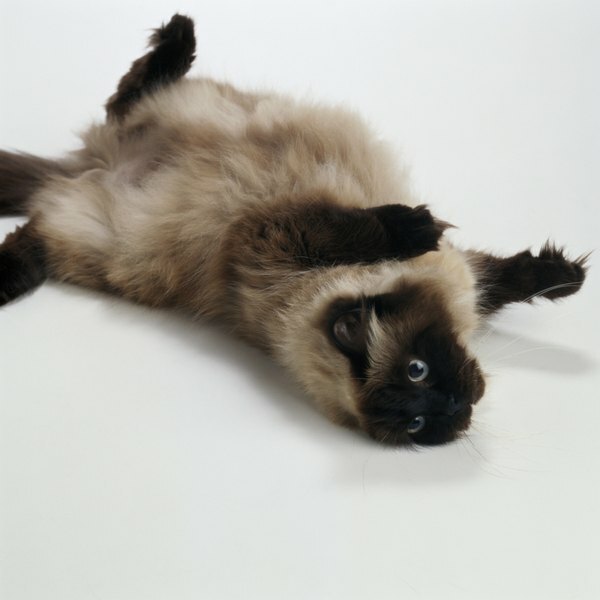 What Are the Treatments for Strabismus in Siamese Cats? Siamese cats are prone to crossed eyes or strabismus. Your Siamese fur baby may have been born with crossed eyes. Sometimes his beautiful eyes look perfectly normal and other times one or both are pointed inward or outward. He may bobble his eyes or shake his head to align his eyes correctly. Strabismus is simply a misdirected gaze. One eye—or both—may point inward. When this happens, your kitty’s eyes are crossed. Your Siamese cat’s eyes may also point outward, making it look as if he is gazing in two directions at once. If your fur baby was born with strabismus, it is not a dangerous condition. Strabismus that develops after birth may be associated with a neurological problem that affects your kitty’s inner ear. If this is the case, he may experience severe dizziness. These attacks of dizziness can cause him to fall from high places. Strabismus that has been present from birth is more likely in flame point Persians, Siamese and Himalayan cats. The eye-bobbling, which is called wandering nystagmus, usually happens when your little guy’s eyes are resting. In the case of congenital strabismus, muscles in his brain or eyes developed abnormally. His eyes may also have developed abnormally before he was born. Vision fibers inside the central nervous system may also be abnormally crossed, leading to your kitty’s strabismus. Because strabismus in Siamese cats is a genetic condition, it is considered normal. It shouldn’t cause any major vision issues for your kitty. For cases of strabismus that develop after birth, the vet will want to run several tests to determine the cause of the condition. In the case of a nerve disorder, he will treat the underlying cause. Surgery can correct abnormal muscles, leading to a correctly realigned eye. The vet may also prescribe therapy exercises to strengthen your kitty’s eye muscles. No treatment is available for congenital strabismus. If your Siamese fur baby was born with congenital strabismus, he won’t need any specific type of home monitoring or treatment. He’ll learn to managed the crossed eyes and double vision on his own. If his crossed eyes developed suddenly, get him to the vet for diagnosis and treatment right away—he could have an undiagnosed head injury or neurological condition. Is It Normal for a Siamese Cat to Be Cross-Eyed?